This is my little schooner. She is 26' LOA, 22'6" LOD, 18'4" LWL, 7'4" Beam, 3.0' Draft, c. 4300# actual displacement (4160 as new), 1640# ballast, 242 ft.sq. sail area, m:109, f:78, j:55, SA/disp. : 15, Displ/lwl: 298, ballst/displ. : 39.4. 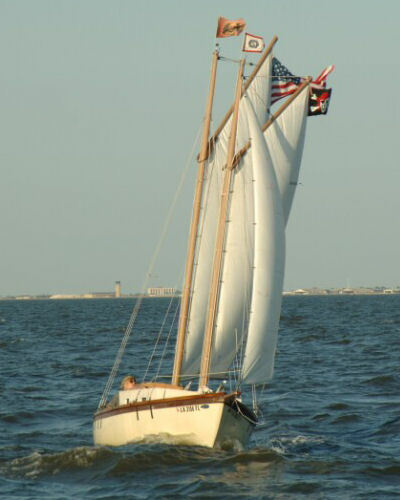 Built in 1982, she is one of 18 built by Mark Marine of New Hampshire of a Chuck Payne design, in fiberglass with aluminum spars. Originally an open boat, sometime in the past a cabin was added and the cockpit extended aft. I hope to remove the cabin in favor of a dodger in the future. I bought her in northern Mass. and now she lives in Lake Ponchartrain. Lovely vessel to sail. We have been racing her PHRF. In windward/leward races we trail the fleet or most of it, but recently we had an offshore 10 kt. breeze and a reach down and back and finished third in fleet! Two articles about her are attached plus a few pictures. I'd love to hear from others with experiences to share. I have added a new picture of the cockpit now that I have removed the cabin. We have a 155% genoa, now, too.